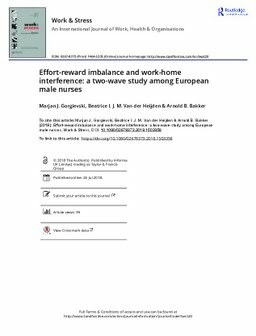 This one-year follow-up study among 1,421 male nurses from seven European countries tested the validity of the Effort-Reward Imbalance (ERI) model in predicting prospective vital exhaustion and work-home interference. We hypothesised that effort and lack of reward would have both main and interactive effects on future outcomes. Results of structural equation modelling (SEM) showed that effort was positively related to exhaustion and work-home interference, both simultaneously and over time. Lack of reward predicted increased exhaustion at follow-up, but effort-reward imbalance did not influence the outcomes. Additionally, Time 1 exhaustion predicted increased work-home interference and exhaustion at follow-up. These results do not support the ERI model, which postulates a primacy of effort-reward imbalance over main effects. Instead, the findings are in line with dual path models of job stress and work-home interference. Multi-group SEM showed partial cross-cultural metric invariance for the ERI measure of effort, but the ERI measure of rewards showed no metric measurement invariance, indicating its meaning is qualitatively different across cultures. Nevertheless, the main conclusions were markedly similar for each national sub-sample. We discuss the theoretical and practical implications of our study.